As a marketing and public relations specialist, Rachel Carter is an expert at crafting narratives that put big ideas into digestible forms. Working independently and for nonprofit organizations such as the Vermont Sustainable Jobs Fund, she's spent two decades helping others realize their dreams. Lately, though, Carter's own life has become a waking nightmare. In January, the 41-year-old was diagnosed with breast cancer. Coupled with a pair of serious preexisting conditions, she has an emotionally draining perfect storm of health problems; Carter reports heightened levels of anxiety and depression since her diagnosis. The ordeal has been equally crippling financially. So Carter did for herself what she's spent a career doing for others: She asked for help. Shortly after the diagnosis, she and her husband, Mitch Pauley, set up a campaign on the popular crowdfunding website GoFundMe to help stave off the avalanche of medical expenses. Pauley's health insurance as a schoolteacher doesn't cover, for example, Carter's lost wages from leaving VSJF or her travel from Plainfield to Burlington for treatment. Through more than 250 individual donations from friends and family — most in the $20 to $100 range — the couple quickly surpassed their $20,000 goal. "The outpouring of support, both financially and emotionally, has been overwhelming," says Carter. She adds that she is considering upping the goal to $30,000 as her treatment path and the associated expenses change. Carter is one of millions of individuals around the globe — including increasing numbers in Vermont — who have turned to crowdfunding to pay for health-related expenses, such as gaps in insurance coverage and ancillary costs of treatment. The trend has become a booming industry. Of the $2 billion in donations raised through California-based GoFundMe since 2010, $930 million came from medical campaigns, according to a 2015 study conducted by the financial website NerdWallet. In 2017, medical fundraising accounted for 21 percent of the platform's active campaigns, says Heidi Hagberg, a GoFundMe communications rep.
"Medical is always one of our biggest categories," she notes, adding that it accounted for more than a third of the money raised on the platform last year. Hagberg suggests that the number is probably even higher because of how GoFundMe users categorize their campaigns. Those labeled "emergencies" or "other," for example, are often related to medical expenses. GoFundMe doesn't track campaigns by state. But another popular site, YouCaring, reports that the number of Vermont-based medical campaigns on its platform grew by 15 percent in both 2016 and 2017. YouCaring communications manager Austin Kapur notes that, globally, the number of medical campaigns on the platform grew three times as fast in 2017 as in 2016. He adds that the majority of Vermont campaigns originate in Burlington, and more than a third of all medical campaigns statewide are related to cancer. "I don't know what we would do without crowdfunding," says Carter. She's not alone. According to a 2016 Federal Reserve study, 47 percent of Americans can't afford even $400 to cover the costs of an emergency. And a recent Harvard Medical School study concluded that medical expenses accounted for more than 60 percent of bankruptcies in the U.S.
"With rising health care costs and widespread inadequate coverage, the burden of major medical expenses is falling more and more on the shoulders of individual Americans," writes YouCaring CEO Dan Saper in a statement to Seven Days. "Although many of those fundraising through YouCaring have medical insurance, significant medical hardship often leaves them unable to pay for high deductibles, continuing costs, special procedures or medically necessary travel," he continues. "Additionally, loss of income often accompanies a cancer or other serious diagnosis, which adds to the stress and exorbitant costs of falling ill in America." The rise of crowdfunding to cover ballooning medical expenses and gaps in health insurance has prompted some observers to point to the trend as a supplement to, or even potential replacement of, the Affordable Care Act. In a 2014 piece for the Los Angeles Register, Michael F. Cannon, director of health policy studies at the Cato Institute — a Charles Koch-founded libertarian think tank — floated relying on "friends, family or the kindness of strangers" as a viable alternative to the ACA. However, the success of Carter's campaign, while not unheard of, may be unusual. In its 2015 study, NerdWallet reported that just 11 percent of medical campaigns met their funding goals. GoFundMe, which Carter is using, did not supply data for that study. But a search of other GoFundMe efforts in Burlington reveals many that remain far short of their goals — some of which have been active for years. Much has been written on the ethical quandaries raised by crowdfunding for medical expenses. These range from privacy concerns around medical information to the threat of fraudulent campaigns to a documented imbalance in the types of campaigns that succeed. The title of a 2015 piece in the Atlantic framed that last issue: "How to Succeed in Crowdfunding: Be Thin, White and Attractive." The Atlantic piece covered the full spectrum of crowdfunding efforts, not just medical ones. But numerous reports have found trends in the kinds of health-related campaigns that meet their goals. In a 2017 article on Buzzfeed, Anne Helen Peterson argued that the same systemic inequalities that plague American society at large bubble up in crowdfunding. "There's a politics to who gets funded and who gets left behind, who collapses under the weight of the broken health care system and who's temporarily buoyed," she wrote. Because social media are the predominant drivers of crowdfunding, shares on Facebook, Twitter and the like are crucial. Accordingly, those with larger social media spheres tend to have the greatest success. Carter, who lives in Plainfield (pop. 1,243), is an exception to the rule. But she has been able to lean on a valuable personal skill: marketing. 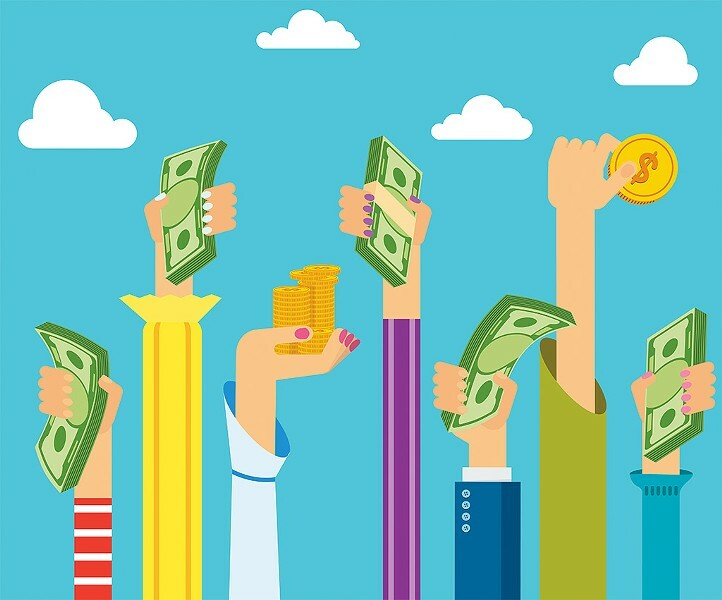 Like most crowdfunding platforms, GoFundMe and YouCaring offer a wealth of tips for launching successful campaigns. The internet is flush with how-to articles on the topic. The gist: Presentation matters. "I'm lucky that I know how to tell a good story," says Carter. That's not to say she dramatized her situation, or even needed to. But where Carter has succeeded — and where campaigns that don't meet their goals tend to fail — is in presenting her story in a compelling and succinct fashion that resonates not just with her friends but with her friends' friends, and their friends, and so on. As of this writing, her campaign has been shared on Facebook more than 600 times, often by people Carter says she doesn't know personally. That's partially a tribute to the extensive network that someone who networks professionally is apt to have. But it's also a testament to the power of a well-told story. "Some people can build a tiny house," says Carter. "But my skills are in marketing and storytelling." Carter is quick to express gratitude for the financial support she's drawn from her GoFundMe campaign. She also highlights the emotional boosts she's received from friends, family and strangers alike, whether or not they've donated. "Not everyone can afford to give money. But just hearing from someone that they're thinking about you or that you're in their prayers really does make a huge difference," she says. A side benefit of crowdfunding, Carter adds, is that it serves as a messaging platform. "Having that conversation, telling people what's going on over and over, is really stressful," she says. "So this really gave us some structure in how to talk about it." For all the benefits she's received from crowdfunding, Carter echoes critical voices who describe the necessity of platforms like GoFundMe as a stark commentary on a health care system in crisis. "Western medicine is all about treating symptoms rather than the underlying causes of illnesses," she says. "It's the same thing with crowdfunding: It's treating the symptoms of a broken system instead of the systemic issues — poverty, inequality, inefficiency — that cause the problems." The original print version of this article was headlined "Helping Handouts"
Who Is Watching Vermont's Legal Guardians?